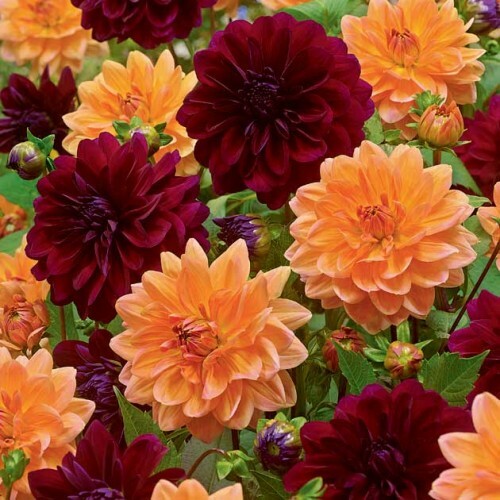 Featuring a mix Waterlily-type dahlias, this fun collection offers cherry-red and apricot coloured hues. The Dahlias in our Tutti Frutti Mix are Waterlily Dahlias. These types of Dahlias actually look like waterlilies and are characterized by fully double blooms of somewhat broad petals giving it a shallow appearance. They grow on very sturdy stems making them excellent for cut flowers. Originating from Mexico and Guatemala, these were the flowers of Inca kings and despite their royal origins Dahlias are amongst the easiest plants to grow in the garden.